Pictured here (l-r) are the lucky prize winner and owner of Brickworks, Andrew Letersky, and his crew. All new approved members of Landscape Ontario who joined the association between Jan. 1 and Feb. 28, 2018 were entered into a prize draw for a chance to win a greening toolkit donated by Makita Canada. 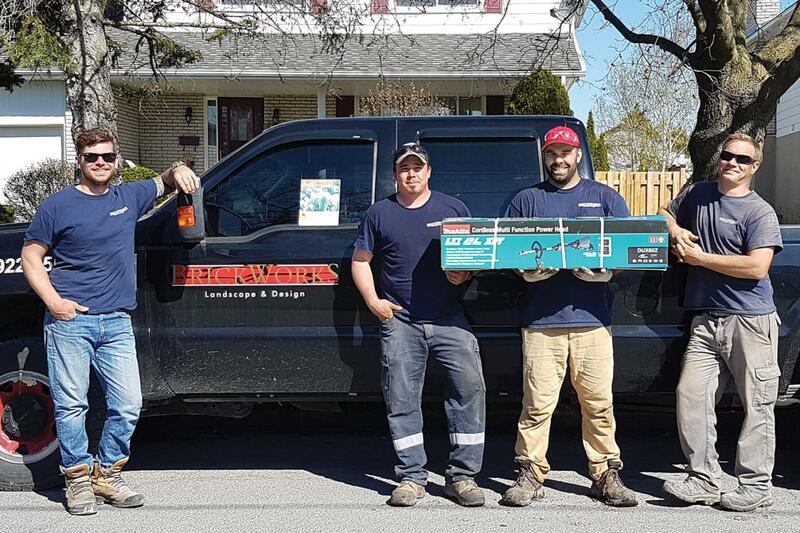 Congratulations to new LO member, Brickworks Landscape and Design of Corbyville, Ont., randomly selected to win the prize package consisting of a cordless (18 volts x2) split shaft multi attachment power head, one of T-03252X Kit which consists of a dual port rapid charger (DC18RD) and two 3.0 Ah batteries (BL1830B with charge indicators) and any an attachment of their choice. LO’s membership services team personally delivered the prizes to Brickworks Landscape Design just in time for the start of the season. The campaign officially launched at Congress ’18.